The blower fan is not working on my 2010 HYUNDAI I30 COMFORT 1.6 CRDI. 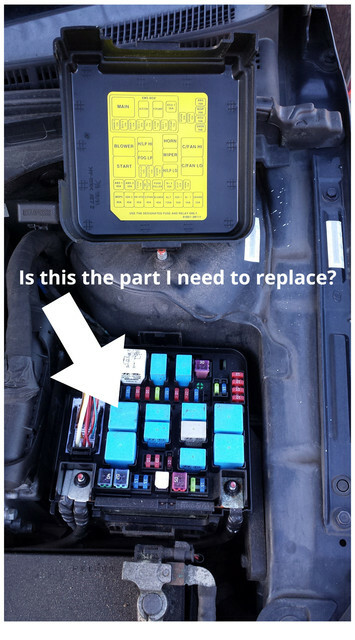 Took it to the garage and the mechanic said that it is the heater relay. He ordered the part and it was booked in for a week later (today). Took the car in today and he said the part hasn't arrived due to being on back order and could take another week or so to arrive. I'm not happy with him not telling me this yesterday but that's another story. We can't continue to drive around without the fan working as the weather at the moment (UK winter) means the windows are constantly steaming up - making it really dangerous to drive. We are having to drive with the two front windows open, which is a pain when it is cold but almost impossible when it is raining. I was hoping to get the part from a scrap yard and replace it myself. Before I try to source it, I need to make sure I am looking for the right part. I'm wondering if the relay marked C/FAN HI could temporarily be inserted into the BLOWER socket to check if their diagnosis is correct? Sorry, I've no idea if the pin configurations are the same for those two relays. Thanks for your suggestion. I tried that but without success. Not sure if relevant to fan blower etc but I take it they checked fuses were ok for heater system. I assume so. In all honesty, I didn't question him. I've been taking cars to him for 20 years and never had any complaints or reason to question his work. He has always been very good. In this instance, I want to see if I can get the part quicker through scrap etc. Precisely the suggestion I would make. All 4 of those larger relays will be the same part. C/FAN Hi is a logical one as that's the radiator fans and only needed if the low speed is insufficient to keep the temp normal. that's what i'd do, prove the fault is that relay otherwise it may be the resistor that sits under the fan motor but you'd have to run with the mechanics report first and swapping those relays is a quick one.